Using this time of the year to review my artwork is misleading yet revealing. The full exploration is omitted. That is the body of work recording experiments, progress and preferences in techniques, materials and design. Yet the time capsule approach unconsciously exposes a compass-nature is my muse. 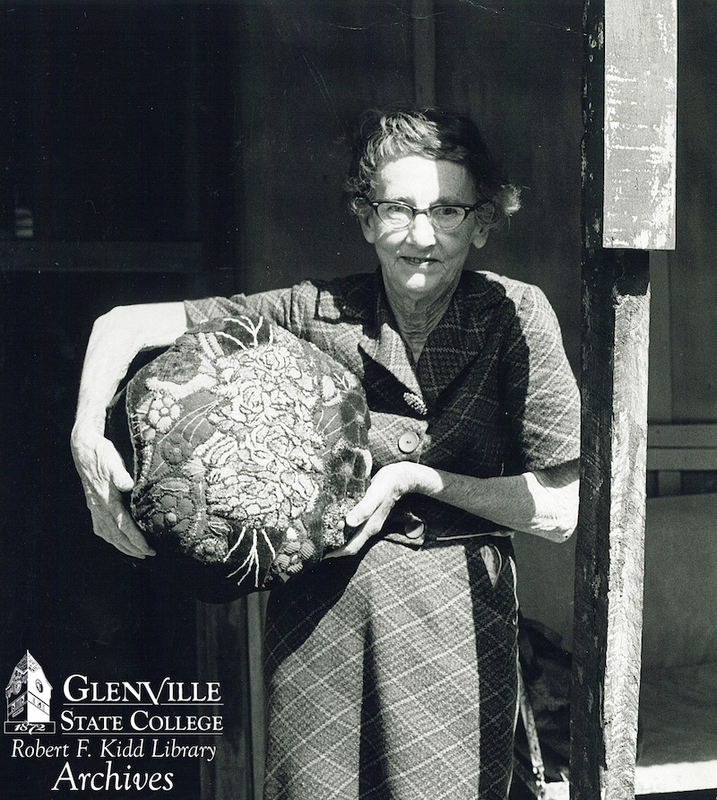 2013 I received a Fellowship from the Tamarack Foundation for the Arts to complete research on Blanche and Oltha McDonald, fiber craftsmen from Gilmer County WV. I also began a Year Study of daily designs exploring my collection of art/craft tools. The Year Study came to a close 11-4-14 with a collection of 365+ works and several larger rugs. My work has not ended though, every piece I think about a lesson learned from the daily exercises. The natural beauty of West Virginia is valued by a variety of economies. It supports tourism, agriculture, transportation, energy and logging along with generations of living with and on the fruits and animals of the land. Progress in the Mountains was created to celebrate and acknowledge the real Wild and Wonderful of the Appalachians in 2015. Along came 2016 and in the fall a big change. My artwork began a period of talking. Craft is a therapy with tools of slow stitching, loop pulling and gratification of controlling the end results. The therapy and a personal effort to become involved with my local community, sharing and listening to multi-generations, seems to have worked this year. I am back to reveling in telling the stories of our natural surroundings. The Leaf Series encapsulates the techniques, materials and design style of my life studies. 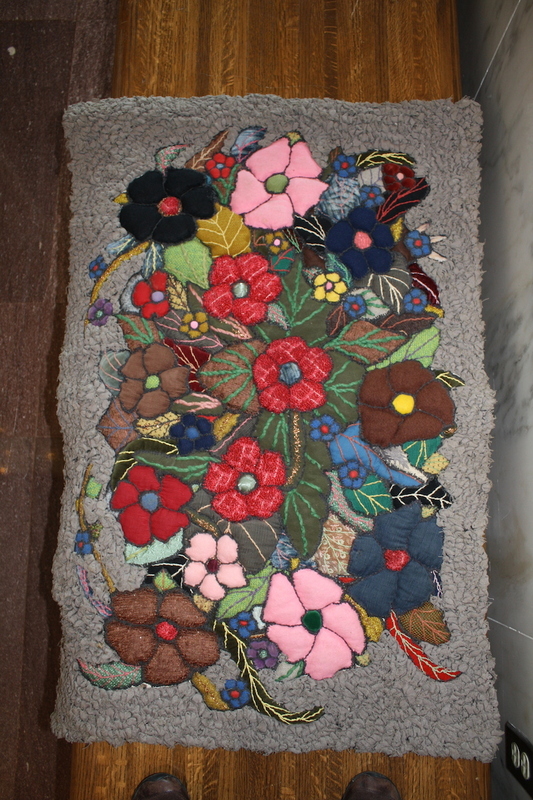 This entry was posted in elements and design in art, Fiber Musings, McDonald Sisters, West Virginia Artists, Year Study and tagged fiber artists, hooked rugs, Susan L. Feller, Tamarack Foundation, west virginia, WV Culture and History on November 4, 2017 by Susan L. Feller. 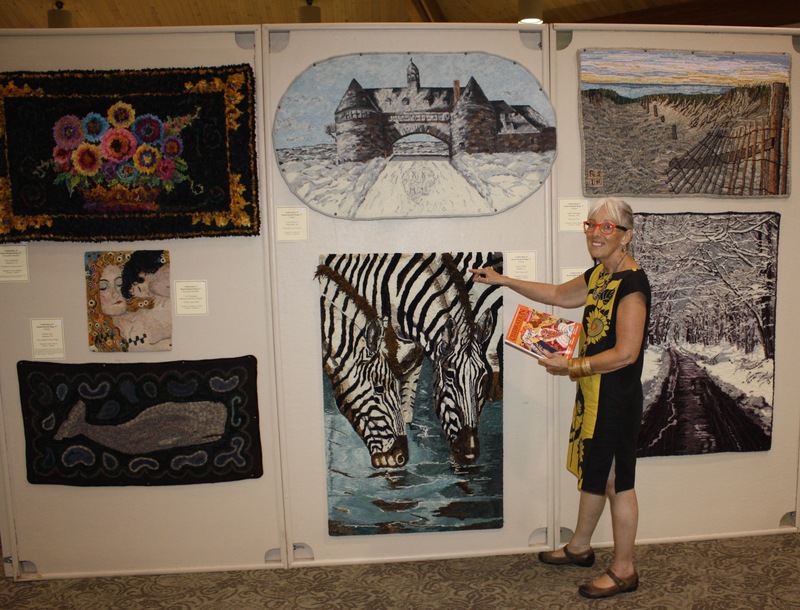 Susan Feller and June Myles presented gallery talks at Sauder Village Rug Hooking Week. As West Virginians each appreciate the heritage involved in rughooking and have been featured in WV Living Magazine with their work. 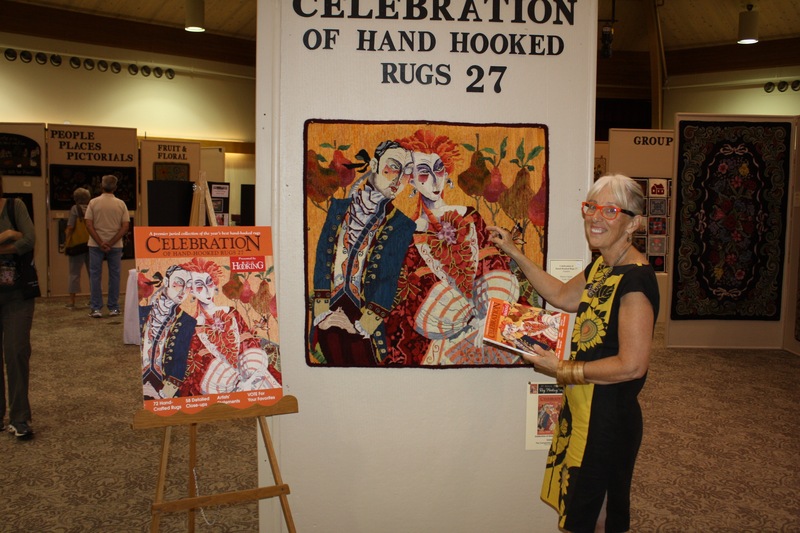 The topic of Susan’s talk was pointing out the elements and principles of design in the winning entries for Celebrations 27, published by Rug Hooking Magazine. 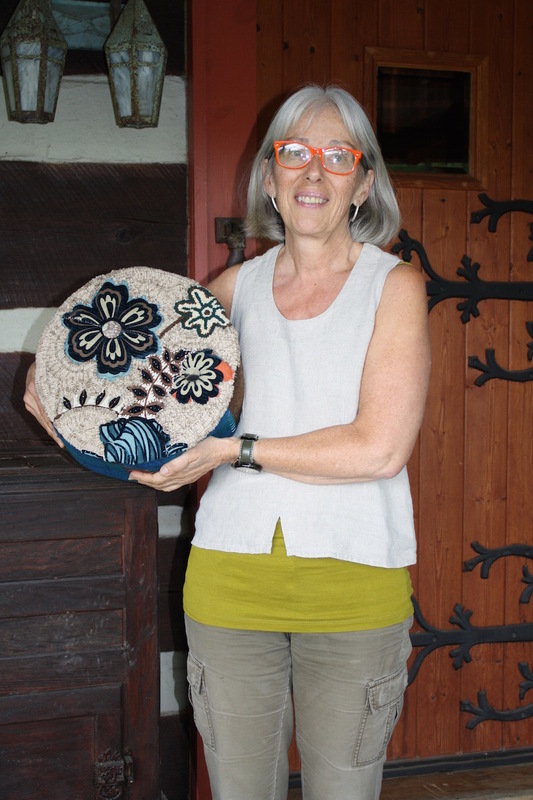 She has been included in three Celebration of Hand-Hooked Rugs issues and a judge, her work has been juried into several contemporary Hooked Art collections. Author of Design Basics for Rug Hookers, Stackpole Books 2011, her advice has helped many create their own “Great rug.” Involved in promoting the traditions carried on by artistic contemporaries, Susan teaches and lectures worldwide, and is a member of TIGHR, McGown and Surface Design. June has been hooking since 1988. She is a graduate of Hollins University in Virginia with a degree in physics, and spent her junior year abroad at the Sorbonne in Paris. She has maintained her interest in science as well as art, serving for three decades as a docent at the American Museum of Natural History. She is the artist and author of the Men Only book and hooked rug collection. The stories June shared about how she selected a newspaper clipping saved for decades, or woodblock from children’s book as subject were encouraging to the audience as resources. She described the variety of materials and techniques used to finish the edges from old chestnut frame by a friendly carpenter to the right beads accenting an Afghanistan fellow. Attendees said participating in the gallery talks at Sauder Village adds to the learning process for the full exhibit. We encourage you all to take advantage of a docent lead discussion on your next museum visit. This entry was posted in elements and design in art, Fiber Musings, hooked rugs, juried art exhibit, textile art, West Virginia Artists and tagged fiber artists, hooked rugs, hooked rugs exhibit, June Myles, Rug Hooking Magazine, Sauder Village, Susan L. Feller, west virginia, WV Culture and History, wvliving magazine on August 18, 2017 by Susan L. Feller. 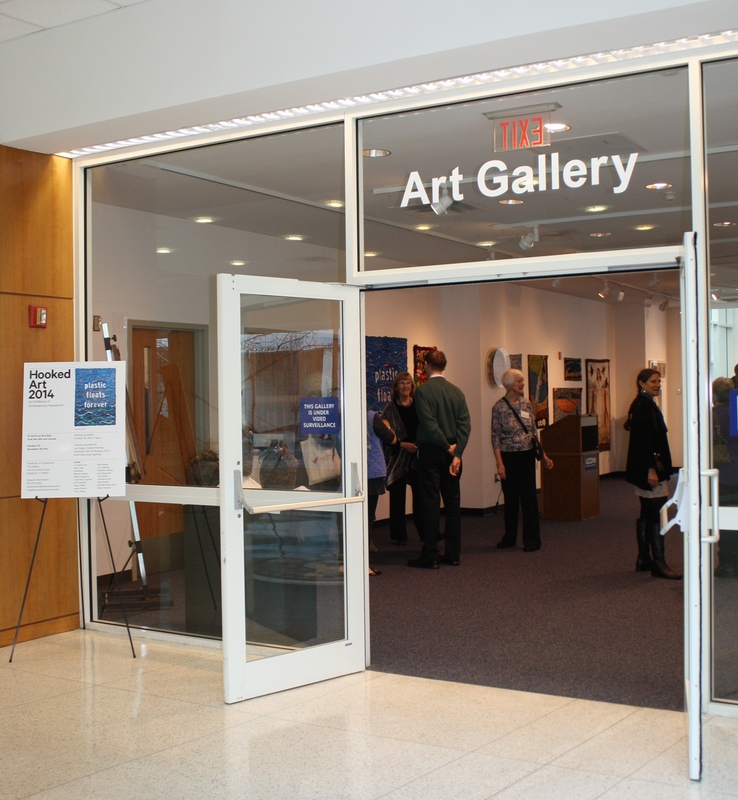 Opening Receptions are great opportunities to meet artists and view artwork and Saturday , October 25 was no exception. 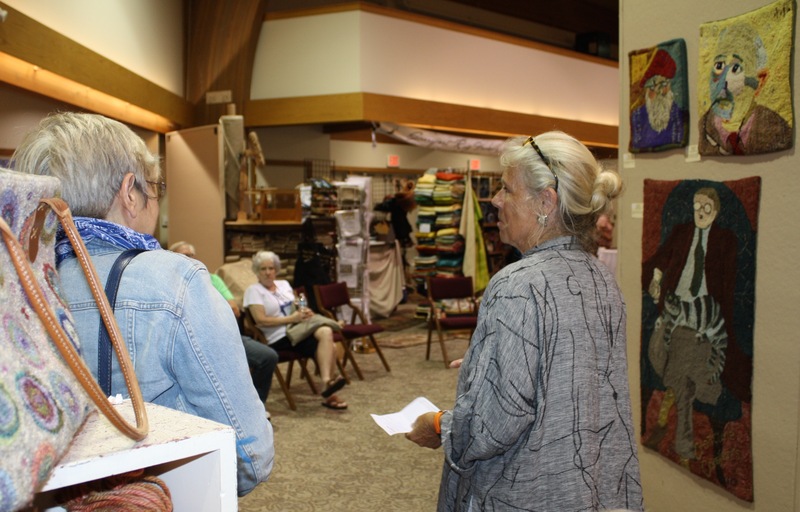 Fifteen of the 18 artists were in attendance to discuss and enjoy the 55 contemporary textile works curated by Liz Alpert Fay in the 10th exhibit sponsored by Newtown Hooked Art Shows with Sherry Paisley. Conversations between artists included topics on process, progress and future studio work while audience members were overheard saying their work would be influenced by the innovative directions they observed on the walls at the UConn Gallery on Stamford, CT campus. Below are two images of work included in this exhibition of contemporary hooked art on view at UConn Gallery in Stamford, CT through November 29. Visit if you can and enjoy the scale of each interacting with the others. See www.NewtownHookedArtShows.com fora link about hours and directions. 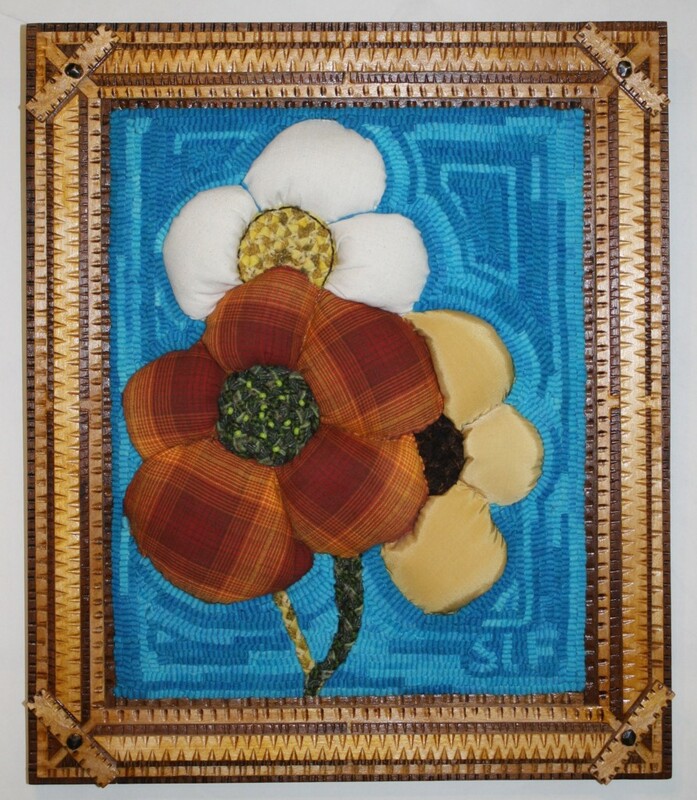 A review in Fiber Art Now magazine Fall 2014 issue includes an interview with Juror of Awards-Lee Kogan, Curator Emerita American Folk Art Museum, New York City. I am happy to announce receipt of a travel grant from WV Div of Culture and History for my trip to the opening and a luncheon with fellow artists. The grant allowed me to meet with my peers, view their work and discuss future fiber projects outside of the State of West Virginia. This entry was posted in elements and design in art, hooked rugs, juried art exhibit, textile art and tagged fiber art now magazine, fiber artists, fine craft, hooked rugs exhibit, liz alpert fay, Michelle Sirois-Silver, Rachel LeBlanc, Susan L. Feller, west virginia, WV Culture and History on October 28, 2014 by Susan L. Feller. 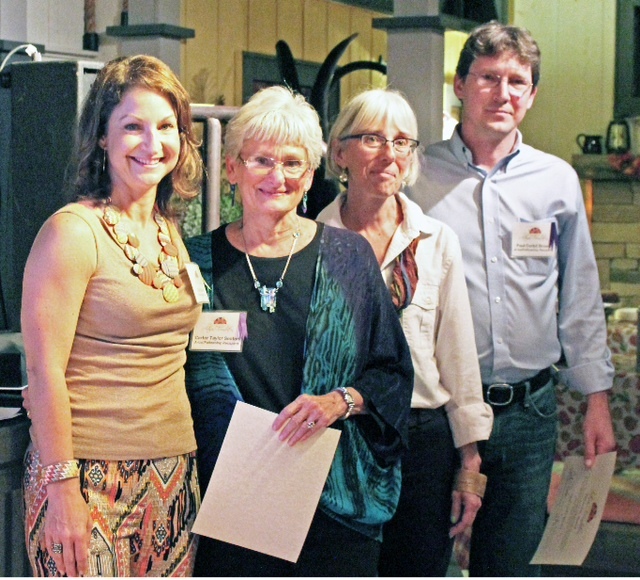 During Tamarack Artisan Foundation’s 10th Anniversary celebration three Fellowship Awards were presented for artistic excellence and lifetime commitment to promoting and fostering the arts in West Virginia. I am honored to have been selected by the review committee along with humanitarian photographer Paul Corbit Brown of Oak Hill and sculptor/author Carter Taylor Seaton from Huntington. The support for artists within West Virginia is unique in the United States. TAMARACK at Beckely was the first facility built as an entrepreneurial opportunity for all art/craftsmen in our state. Since 1979 a Bi-Ennial Juried Exhibition with $30,000 in awards funded through the Division of History and Culture has acquired for the State Museum contemporary works. The Tamarack Foundation is extremely important to the proliferation and continuation of art made in West Virginia because it raises funds from corporate and private donors and distributes these by supporting artists to create a national market; grants and awards for juried shows and lifetime achievement; and acts as ambassador and lobbyists for independant craftspeople. 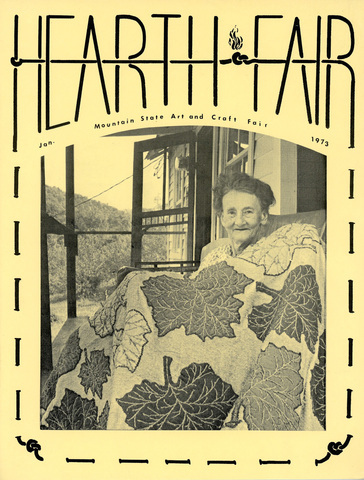 I submitted a project to research the social environment of Blanche and Otha McDonald of Letter Gap, WV during the 1960’s as they created fiber works using hand sewing techniques (including ‘faux hooking’). The funds will help in travel expenses to catalog stories and images of works from collectors into a publication with step-by-step directions for fiber artists to be inspired to create contemporary works. Teaching these skills and the story of these two independant women is my goal. 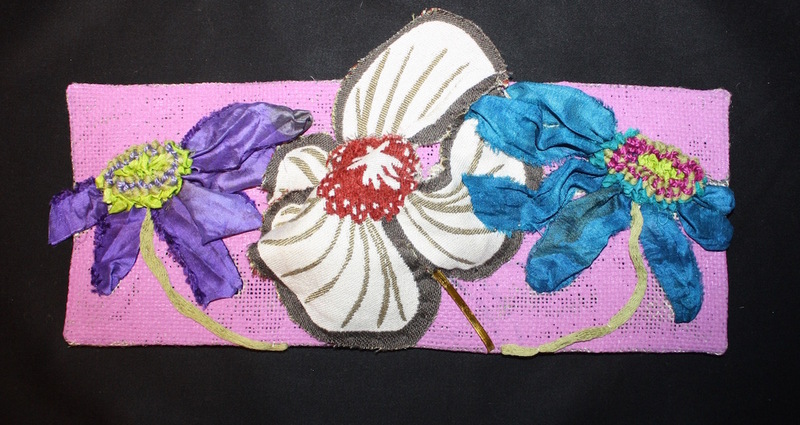 This entry was posted in McDonald Sisters, textile art and tagged Carter Taylor Seaton, fine craft, McDonald Sisters, Paul Corbit Brown, Susan L. Feller, Tamarack, Tamarack Foundation, WV Culture and History on November 30, 2013 by Susan L. Feller. The studio has offered me organized space to work and explore. Several pieces were submitted to different juried and invitational shows. Haying Stages was accepted in 7Stitch shown at Morehead State College in Morehead, KY this summer. It was a Surface Design exhibit and juried by the President Jane Dunnewold. It was also accepted in the WV Div of Culture and History Biennial Juried Exhibition to be hung in the Dunn Building in Martinsburg, November 24- Feb 27, 2014. Iconic Liberty received first place in West Virginia in the national theme American Heritage for the NSDAR. Caraway Garden Runner was accepted along with Veins of Energy – Coal in the Best of West Virginia juried show at TAMARACK in Beckley, WV. 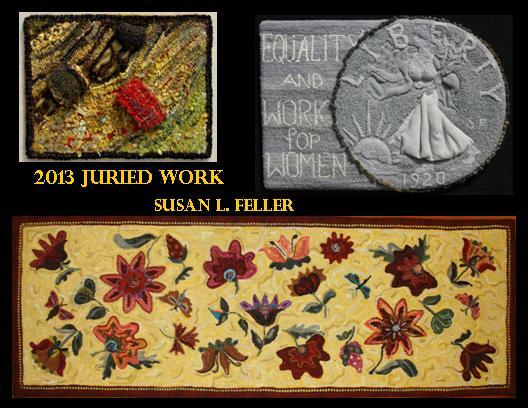 This entry was posted in elements and design in art, hooked rugs, juried art exhibit, juried exhibits, Uncategorized and tagged fiber artists, juried fine craft, Susan L. Feller, Tamarack, the best of West Virginia, WV Culture and History on October 1, 2013 by Susan L. Feller. Just received notice that “Winter in West Virginia” was accepted in the Inspired: A West Virginia Series of Juried Exhibitions Historic Buildings. The opening ceremony was on January 24, 2011 at the WV Culture Center, 1900 Kanawha Blvd, E. Charleston, WV. Show up through July 25. Yes that is the Capitol of West Virginia! Visit www.wvculture.org, exhibits for details about hours of the Commissioner’s gallery. This piece was one of the 6 works reviewed by jurors for TAMARACK for the category FINE CRAFT. It was created in 2009 for a travelling exhibit titled STRIPES. The artists from Japan and the United States each interpreted that word using some type of rughooking. I happily packed my work up and sent it off today, for one more leg of its journey. Japan, NJ, IN and now Charleston, WV. It is for sale, but I do hope to see its return at the end of the show, since the inspiration is a view right out our kitchen looking towards Short Mountain. 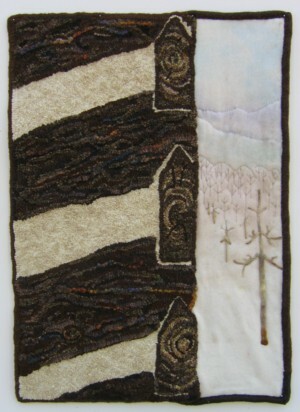 This entry was posted in Fiber Musings, hooked rugs, juried art exhibit, juried exhibits, textile art and tagged fiber artists, fibers, hooked rugs exhibit, juried fine craft, rug hooking, Susan Feller, Susan L. Feller, Tamarack, west virginia, West Virginia Culture and History, WV Culture and History on January 7, 2011 by Susan L. Feller.